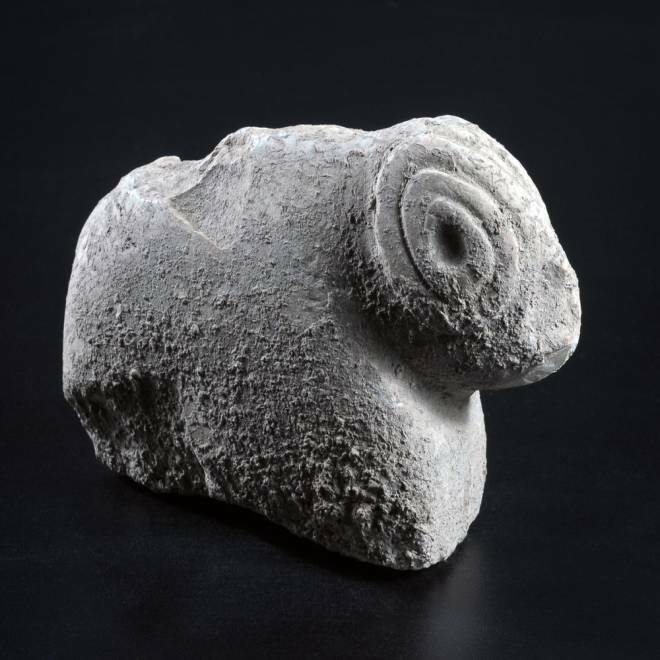 Archaeologists say this limestone figurine of a ram, discovered at a highway construction site between Jerusalem and Tel Aviv, dates back 9,000 to 9,500 years. Israeli archaeologists say two animal-shaped figurines discovered at the site of an Israeli highway construction project go back more than 9,000 years, and reflect the religious practices that were common in the region several millennia before Moses. "It is known that hunting was the major activity in this period," Hamoud Khalaily, one of the directors of the Tel Mosa dig, said in a statement issued Wednesday by the Israeli Antiquities Authority. "Presumably, the figurines served as good-luck statues for ensuring the success of the hunt and might have been the focus of a traditional ceremony the hunters performed before going out into the field to pursue their prey." One of the figurines, sculpted from limestone and measuring about 6 inches (15 centimeters) in length, looks like a horned ram. The other, smoothed and shaped from dolomite, seems to depict a buffalo, ox or other type of bovine animal, archaeologists said. The Stone Age figurines turned up during an excavation that's being conducted a few miles north of Jerusalem to clear the way for widening Highway 1 to Tel Aviv. The project's directors said they were found last week, near a large round building that had a foundation built from fieldstones, and an upper wall section apparently made of mud brick. Khalaily and excavation co-director Anna Eirikh said the finds date back 9,000 to 9,500 years. That's thousands of years before the time of Moses, who was thought to have lived in the time frame of 1400 to 1500 B.C. But the period when the figurines were created, known as the Pre-Pottery Neolithic B, may have been as much of a turning point for the region's social and religious practices as Moses' time was. 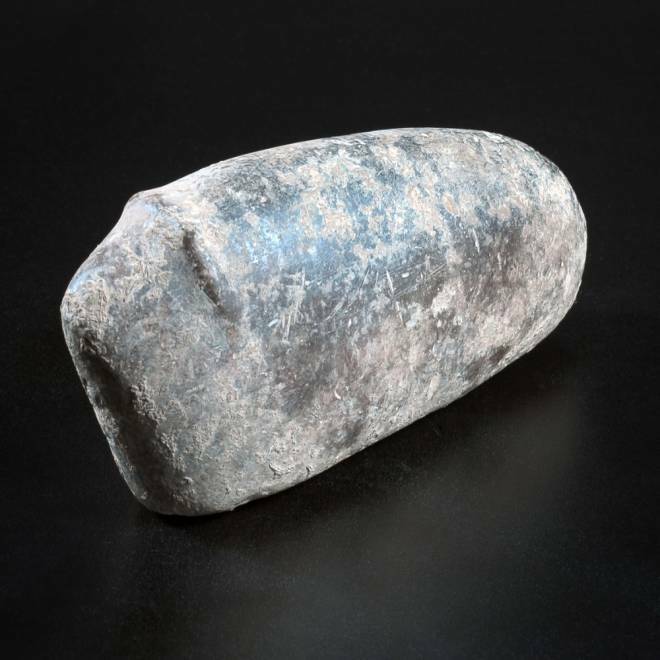 This 9,000-year-old figurine was sculpted from dolomite, excavation directors Anna Eirikh and Hamoudi Khalaily said in a statement from the Israel Antiquities Authority. They said it "seems to depict a large animal with prominent horns that separate the elongated body from the head. The horns emerge from the middle of the head sideward and resemble those of a wild bovine or buffalo." "The Pre-Pottery Neolithic B period ... is considered one of the most fascinating chapters in the history of mankind; many changes took place in it that shaped human society for thousands of years to come," Khalaily said. "During this period, the transition began from nomadism, based on hunting and gathering, to sedentary life, based on farming and grazing." This was the age when animals were being domesticated, agriculture was on the rise, and urban settlements (including one of the earlier incarnations of the biblical city of Jericho) were being built up. Religion, too, was being codified. At Turkey's Göbekli Tepe archaeological site, for example, researchers have found the world's oldest-known temple, a place of worship that was first built up as far back as 12,000 years ago and was still apparently in use when the Tel Mosa figurines were sculpted hundreds of miles away. Khalaily suspects that the figurines were used as good-luck charms for hunting, but Eirikh has an alternate theory: Perhaps the figurines were associated with efforts to domesticate wild oxen or goats. Either way, these statuettes served as stand-ins for the creatures that Stone Age societies were beginning to bring under their control.